Action Plans | Apple Training Institute, U.Va. The goal of the APPLE Training Institute is to empower teams of student-athletes and administrators in creating institution-specific action plans to promote student-athlete health and wellness. All teams are required to submit their action plans prior to departure from the institute. Each team selects a primary “slice” of the APPLE model and a secondary focus if applicable. Seventy-six teams, representing all three NCAA divisions, attended the January 2017 institutes. We are pleased to share details from the action plans they submitted. Create a recruitment policy focusing on the on-campus visit. The policy will include pre-visit preparation, hosting guidelines, and post-visit wrap-up. Create a recruitment brochure to send with prospective student-athletes after their official visit. Also, to establish a department-wide standard for hosts of recruits and require coaches to hold a meeting with potential hosts at beginning of the year to establish expectations. Plan to develop tools to help student-athlete hosts and recruits to have a better experience. We have a new hosting policy recently implemented in the athletics department. We will also create a hosting guide and workshop to help student-athlete hosts. Create a social norms campaign to change a culture of binge drinking among athletes. Create roundtable discussion series that focuses on a mutual standard of respect. Build upon the current peer mentorship program to include student-athlete buy-in, coaches involvement, with the goal of educating mentee’s on the life of a student-athlete and developing ongoing friendships. Make recommendations to administration for student-athlete code of conduct and recruitment visit guidelines in the student-athlete handbook. Also, plan to recommend standardized structure for beginning of the season team meetings. Ensure that we have a consistent and efficient ATOD department policy for our teams to follow as a minimum. We desire for our student-athletes to not only have an understanding of this policy, but to have a say in the policy development. This policy should be reviewed at the end of each year by the policy committee to stay relevant, efficient, and effective. Student-athletes will have a clear understanding of athletic policies, including expectations for ATOD use, consequences associated with ATOD use, and resources focused on student-athlete wellness. Create a student-athlete handbook to have an accessible resource for student-athletes to inform them and educate them on campus policies and information, thus increasing student-athlete awareness of rules and policies. Education and training of drugs and alcohol use and their effects on student-athletes as well as training on NCAA and institutional policies for the use of drugs and alcohol. Circulating a pre-assessment of where our student-athletes currently are concerning their alcohol/drug use. From that information, we can then create the most effective educational program to help decrease unsafe alcohol/drug use patterns that we have found. Conduct an alcohol education program for incoming freshmen and transfer student-athletes during the first two weeks of their first semester. Train our SAAC on the Step Up Bystander Intervention Program. Add some new elements to our annual freshmen student-athlete presentation and create informational posters in all locker rooms. Create a peer-to-peer ATOD educational workshop for all student athletes using a Kahoot based informational presentation. We will be implementing the same educational workshop for all incoming freshmen/transfer student athletes during our Peers Helping Athletes Transition workshop series. Following the presentation, we will conduct a post presentation survey to receive feedback on the effectiveness of the presentation. Changing our drug testing policy to align more with our conference. Plan to add a safe harbor program. 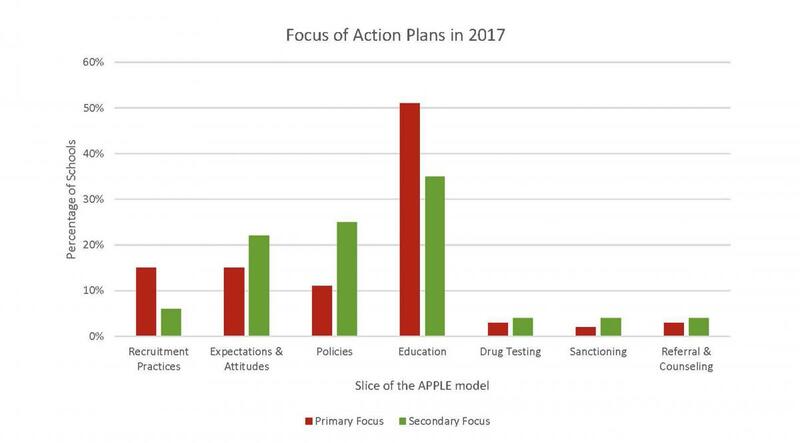 Our APPLE team plans to develop and implement a hierarchy of consequences for drug and alcohol policy violations. Re-examine our Drug Testing & ATOD Education Program-its sanctioning & referral/counseling component with student-athlete input. Utilize/expand our peer mentors to inform student-athletes about programs available on campus and resources/people to use in different situations; identify athletes needing support; partner with Student Wellness & Student Health, and Athletics Health, Wellbeing & Sports Performance team in education and support services. Raise awareness of mental health issues and resources by educating and equipping peer leaders. Also, incorporate mental wellness into bystander intervention training.